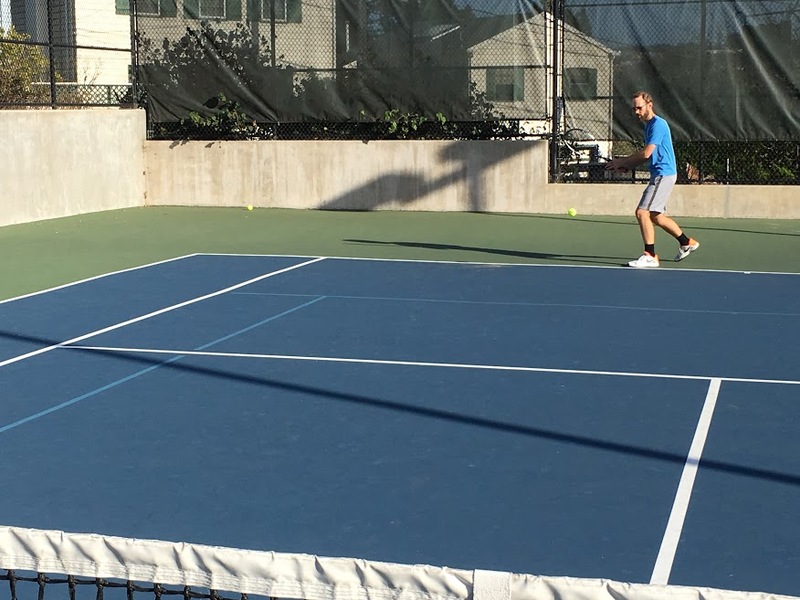 Tennis League Network Blog: Ari Chasnoff: 213 Matches Played. Wow! Checking in with Ari Chasnoff out of the TennisSF.com tennis league. I’ve participated in TennisSF for almost five years, starting at the 3.0 level and working my way up to the 4.0 division. I did some research online and found that it was the quickest and most affordable way to get out on the courts and start playing competitive matches. I’ve played 213 (as of Feb. 7th, 2017) matches over four and a half years, and only missed three or four seasons along the way. That means about once or twice per week. But who’s counting? My rule of thumb is that as long as I can lift my arms I try to play every few days. I like the scheduling flexibility and getting to know people who are also passionate about tennis. But it’s more than that. It also provides a reliable framework to pursue personal goals, like improving focus, living in the moment, and controlling my emotions in stressful situations. Unfortunately every match is a little too memorable. The night after a match I often find myself going over certain points in my head as I’m trying to fall asleep - my best shots, my opponent’s best shots, and what I should have done better. Back when I started in the league I remember long 3-setters against Kwok, Bryce, and Rahul. Those guys forced me to play at a higher level. Then of course there was the championship match one season against Demetrius. We had played each other several times already at that point and had gotten to know each other, so we both were very relaxed and having a lot of fun. He won in a close 3-setter, surprising me with backhand chip shots down the line, but overall the match was played with excellent sportsmanship and competitive spirit. I never played on a team or in any organized fashion before the league. Up until my late 20’s it was always a matter of getting a cheap racket and hitting around with friends. I had taken some lessons while in highschool, but since I grew up in Chicago it was hard to maintain a steady practice. When I moved to San Francisco in my early 30’s I was determined to play more. 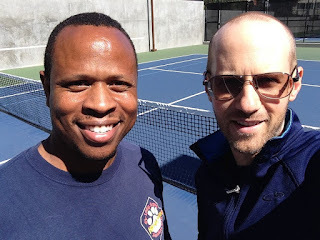 Recently I took some lessons from Coach McClane, the legendary San Francisco tennis instructor. He’s the guy on Yelp that turns up at the top when you search for “tennis lessons” in San Francisco. I was curious what the hype was all about. I was about a 3.5 at the time, pushing 3.75, and I told him my goal was to get to 4.0. He got me there in six lessons. He not only taught me important skills, but he revived a joy of tennis that I had momentarily lost in my drive to improve. That’s what ultimately helped me raise my game. One of my favorite things about the sport is that you can improve quickly if you put in the time and practice the fundamentals. Watching the ball and building consistency will go a long away, even against superior players. The mental element of the game also fascinates me. Andre Agassi’s autobiography Open was an interesting look at the psychological hoops even the pros have to jump through. The Inner Tennis books by Timothy Gallwey explore this topic and offer some useful exercises along the way. I’m at the point that even when I pick up the occasional book on Zen I read it like it’s a tennis manual! For the past four years I’ve been a marketing and communications manager at Stanford Graduate School of Business, specializing in web design, social media, and video production. My office is across the street from Stanford’s Taube tennis stadium so I often eat lunch while watching the Cardinal practice or play their collegiate matches. I’ve learned a thing or two just watching these incredibly talented students and their amazing coaches, among them former pro Paul Goldstein. My wife of eight years isn’t into tennis, so I do get some variety in my life. She’s an artist, painting large-scale oil paintings that show in galleries and museums. Check out her work at www.rebekahgoldstein.com!